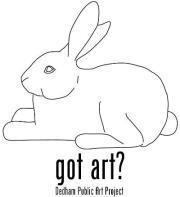 Although we haven’t been talking about them as much lately, a lot has been happening with the bunnies in the Dedham Public Art Project. Of course, the big news is that the Bengal Bunny is finally repaired, which means that The Five-Year-Old and I were finally able to see him in all his glory last Sunday. As far as we know, he won’t be reinstalled at Paul Park, but you will have a chance to see the Bengal Bunny at the Rabbit Farewell Event on November 3. And of course, if you win the raffle for the Bengal Bunny, you’ll be able to see him any time you please. The other bunny vandalized this summer, the Race Car Rabbit, is undergoing repairs of his own. The artist plans to have the rabbit repaired in time for the Farewell Event on November 3 (more on that below). This week, Dedham Shines announced that they are planning to donate Leroy, the Peace Rabbit to the town of Dedham for permanent public display. Needless to say, The Five-Year-Old and I are extremely happy that we won’t have to say goodbye to this gorgeous bunny. If your child is anything like The Five-Year-Old, she’s been asking all summer to paint a rabbit of her own. Well, now she can. Dedham Shines has printed up a batch of paintable t-shirts and is selling them at the Dedham Farmer’s Market for just $10/each. You and your child can paint them on the spot with fabric markers or take them home for more elaborate design work. Finally, everyone is invited to the Rabbit Farewell Open House on November 3 from 12-4 p.m. at the First Church in Dedham. All 15 sculptures will be assembled in one location for the event. Come take pictures, learn about the artists, do some crafts, and monitor the final hours of the online auction. Auction and raffle winners will be announced at the event, but you do not have to be present to win. Suggested donation: $5/person, $10/family.